As the title states and in contrast to his other recent books this book is really focusing on architecture. He clearly describes what architecture is about and what good architecture is, from his perspective. Part 1 gives a general introduction into design and architecture. Part 2 gives a nice overview on the different programming paradigms. Part 3 discusses the SOLID principles briefly - not as deeply as in Agile Principles, Patterns, and Practices in C# but clearly deep enough to understand them. If you have read Agile Principles, Patterns, and Practices in C# you can rush through that part. Part 4 discusses component principles which are also like the SOLID principles deeply discussed already in Agile Principles, Patterns, and Practices in C#. So again, if you have read that book already you can rush through that part as well. Part 5 finally is - I fell - the core part of the book. The first chapters prepare the path to the “Clean Architecture” by highlighting the importance of keeping options open by decoupling independent aspects and drawing borders between them - e.g. design a system device independent”. It continues motivating “framework independence” as frameworks are also just details, instead the business and its domain should shape the landscape of an architecture. 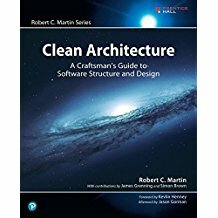 Finally chapter 22 and the subsequent chapters describes the “Clean Architecture” and how it should be put into context. Part 6 completes the picture on the “Clean Architecture” by looking at “the details” like the database and the web. How to implement Clean Architecture? Of course the book contains practical examples but it doesn’t go too much into detail. When you try to realize the Clean Architecture the first time you probably will have still questions which I try to answer in my blog series on How to implement the Clean Architecture?.